First, the cover. I love the composition. It paints a very bleak picture as Jack trundles on through a snowy wasteland, hunted by the dangers of it. The best part about it is that despite the composition being dominated by a white colour palette, Andy Suriano still manages to bring out a ton of details. And the look on Jack’s face is pretty damn spot on, as is the predatory hunter on the bear’s face. The series has had some great covers till now, and this one is another feather in the cap of the creators. The story itself, like I said, is simple. Jack is in a new town and the villain is easy to make out. This time it is an inconsiderate ruler who is ageless and dominates the townspeople with her robotic army. From there, we have the cycle of all of Jack’s stories: at first he is unsuccessful against the villains, but then bounces back quite handsomely and ultimately leaves the place, his good dead of the day done. I love that simplicity. While there have been some complex stories with Jack previously and just the last issue was a bit on that road, he has always been a character to value the simplicity in life, in all its forms. Which is why its great that Jim Zub seemingly gets the character so well and he writes stories that totally fits his attitude and his personality. This is something really valuable to hold on to with tie-in fiction, and I definitely have to commend IDW on picking Jim for the job of writing this series. They’ve made a perfect choice here. One thing I feel could have been improved upon was showing more of Jack’s journey. The first two pages show Jack proving his mettle against the elements and the splash page here is one of the best pages that Andy Suriano and colourist Josh Burcham have turned out to date. I would have liked to see more of this because I felt it would have added more to the character of Jack’s journey itself. Because right now, we don’t really get to see that. Jack arrives, Jack fights, Jack leaves. Its not a bad thing, I just want to see more of an improvement. And also, this issue did a fairly good job of showing how the various Threads of Time that Jack has already gathered are slowly gathering power on their own. It is a bit understated in the issue, but is nevertheless one of the many highlights of it. It is the little things like this that make this series so good. Andy and Josh are just plain amazing. Issue after issue I fall in love with their work and this issue is no different in that regard. Throughout this issue, these two were on top of their game. The local townspeople are drawn and coloured pretty amazingly. There is a strong blue tint to everything to account for the icy setting, but nevertheless the artists manage to really brighten things up by mixing it all up here and there. Each page is better than the last and that’s just the way things are in this series. Shawn Lee’s letters also do their part in making this a good issue all throughout. If you notice, when Jack is on the outside and there’s an exclamation, the font is icy-blue; when Jack is indoors and there’s an exclamation, the font is colourful every time. That’s great! So there we have it. Another stellar issue from Jim, Andy, Josh and Shawn. I really hope that these guys all stick together on this series for a good long while. More Samurai Jack: #1, #2, #3. 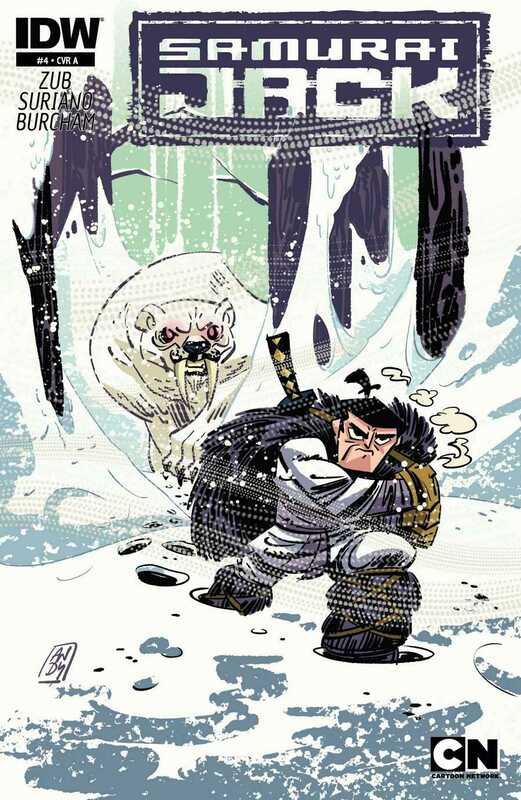 Posted on January 22, 2014, in Comics Reviews, Review Central and tagged Andy Suriano, Animated Series, Cartoon Network, Cartoons, Comic, Comics Review, Demon Aku, Fantasy, Genndy Tartakovsky, IDW Publishing, Jim Zub, Josh Burcham, magic, Review, Review Central, Samurai, Samurai Jack, Sword and Sorcery, Techno-Fantasy, Techno-sorcery, Time Travel. Bookmark the permalink. 12 Comments.